It’s a brilliant story, it has everything: a dead body, academic eccentricity, reanimation of a corpse, ancient tradition…what’s not to love? Except, unfortunately, it’s a myth. One of the many legends that have built up around the ‘old radical’ that I have no doubt that he would have enjoyed. The auto-icon possibly did attend council meetings to mark the 100th and 150th anniversaries of the founding of UCL (1926 and 1976 respectively). I say possibility because even though it is given as fact by several sources, including Wikipedia, there is no proof in the auto-icon archive. 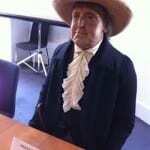 I tend to treat any Bentham ‘fact’ with suspicion unless a few different sources verify it. 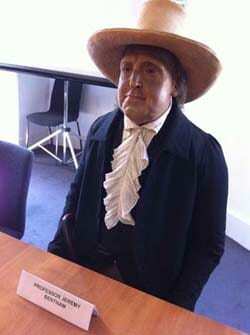 A lot of visitors love Bentham; we need to know that what we are telling them is true. Given the end of the Provost’s ten year stint, and the fact it was upsetting seeing the disappointed looks on visitors faces when asked if the story was true, we decided to make myth a reality. And not only that, we would take lots of pictures and make sure that it was definitely recorded in our archives for future generations. ‘Last one to stand has to get the coffee’. One of the main reasons that we don’t get the auto-icon out that often, except to clean or inspect it, is that it’s not an easy job. 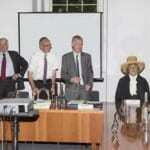 It takes 3 people to move and, as Bentham’s skeleton is bolted to his chair, it has to be moved in one go. This involves two people carrying the chair and body, while a third holds onto the feet to try to keep them still. The skeleton is held together with copper wire and hinges at the joints, which means in theory the auto-icon could move like a living person. In practice this means that his feet want to stay on the ground or, if held high enough, dangle off the chair. An absolute nightmare when you are trying to move delicately. 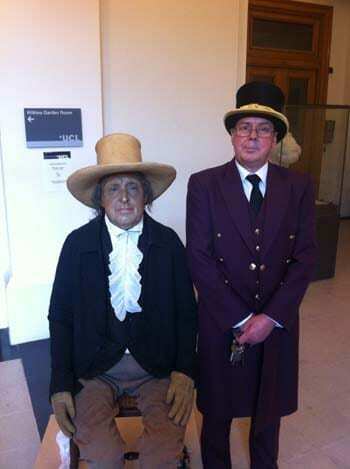 Another reason why we try not to move it is the fear of pests getting onto Bentham’s clothes, eating away and causing huge damage. The undershirt had to be replaced in 1939 because of this, and it has been treated twice for infestations since the 1980’s. Small holes and areas of grazing are clearly visible on the clothes. The first thing I did as soon as we got him safely into the council chamber was hoover the floor, to try get rid of any bugs or beats. The auto-icon never touched the floor during its outing, to avoid any bugs that might be lurking. Time for the Council to get down to serious business. 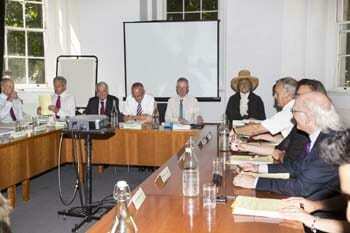 After an hour or so sitting with the corpse of the 84 year old, the members of the Council started arriving. The attendees seemed to fall into three groups. Those who knew about it before walked into the room scanning the faces of everyone sat down until spotting him, stopped briefly and laughed. The second group were people who had no idea that it would be happening. They walked into the room, usually made it to their seats and then looked about before spotting him (it was probably his hat which gave him away), looked surprised and then usually asking if it was really him before laughing. Both these groups then pulled out their phones and took pictures. The final group consisted of people who walked in, dropped their stuff off at their desk, went for a coffee and then sat down at their desk without seeing him. I have to say that most of the student representatives fell into this category. by dressing in the traditional beadle outfit. The Council meeting lasted for well over three hours and I’m sure there were a lot of questions addressed to Jeremy during it. 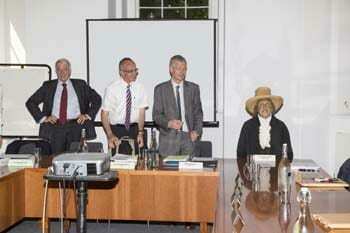 Afterwards it was time to return it to its usual home, and put Jeremy Bentham to bed. 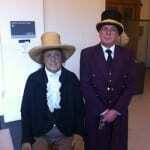 Further Bentham news and information can be found on our auto-icon webpages. Nick Booth is one of the Curators of the Teaching and Research Collections at UCL.